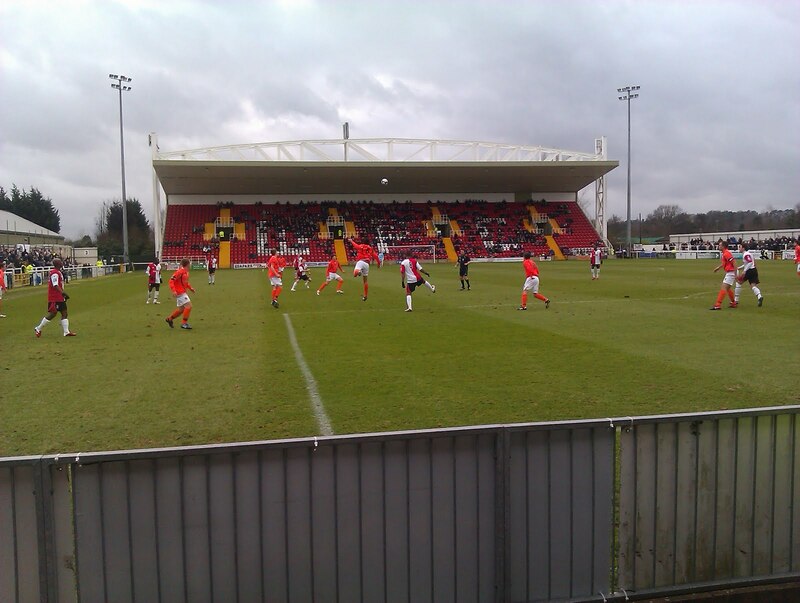 My sixth stadium of 2011 was on Saturday 5th February 2011 at Kingfield Stadium in Woking, Surrey. The match was Woking vs. Salisbury City in the F.A. Trophy 3rd Round. Kingfield Stadium is situated around 1 mile from Woking railway station, in a residential area to the south of the town centre. The venue has been home to Woking since 1922. Kingfield Stadium is a very mixed ground containing four unique sides. The Leslie Gosden Stand completely dwarfs the rest of the ground and the modern all-seater stand, capable of holding 2,000 fans, is significantly better than the rest of the other areas. The East Stand consists of a couple of small seated stands taking up around half the side of the ground on which it sits. The Chris Lane Terrace on the west side of the ground is an uncovered terrace where away fans are positioned if they bring a sufficient number as Salisbury did for this game. The remaining stand in the ground is the Kingfield Road End which was is basic standing terraces. This was where I watched the game from. The game was an F.A. Trophy 3rd Round tie between Conference South side Woking and Southern Premier League side Salisbury City who had recently been relegated two divisions from Conference National due to financial difficulties. Salisbury brought a very large following considering their stature and out-sung the disgruntled Woking fans all day. Their team played well and were good money for their 2-0 win to take them through to the 4th round of the competition.